This shows the excellent ridge route of Rough Crag and Long Stile which runs from Mardale Head to the summit of High Street. 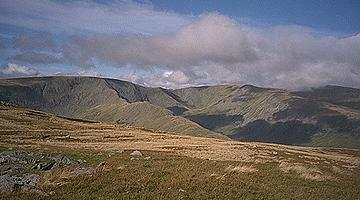 To the right of the ridge is the valley of Riggindale with Kidsty Pike further to the right. High Raise is on the extreme right, wreathed in cloud. Larger version of this picture.